Sure, Pizza Ranch makes great pizza, but they reckon it could be better! Which is why they’re asking for your feedback at – www.pizzaranchfeedback.com – and giving you the chance to win a $250 Gift Card! 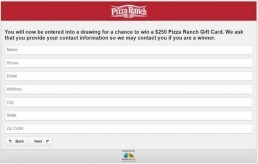 It’s surprising, normally in a sweepstakes survey giveaway there is a list of rules that all entrants need to follow in order to qualify for the prize if they are drawn as the winner. I had a look for them in Pizza Ranch’s survey and couldn’t find any! You know what that means – no rules 😀 Just head on in, complete the survey, and you’ll go in the running. Did I eat at the buffet? Order delivery? 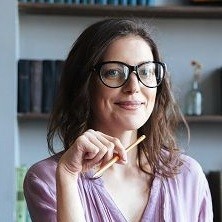 Or dine-in on the menu? How satisfied was I with the overall experience I had? Did I think I received good value for money? How well did a team member handle any queries I had? How good was the food? Was the order I received accurate? 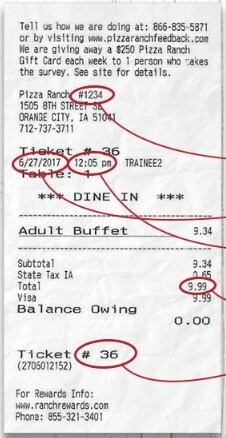 How likely is it that I’d choose to eat at Pizza Ranch again in the future? 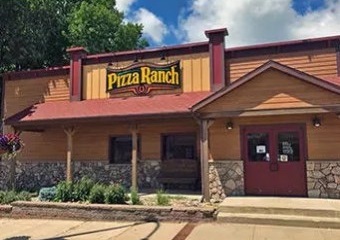 I would never in a million years associate cowboys with pizza… but, Pizza Ranch, which was founded in the mid-west, definitely puts the yee-haw into their oh-so-famous slices. It was the fruit of labor for a young, 19-year-old boy called Adrie Groeneweg. The young entrepreneur was sick to death of driving out of town just to get a slice of his favorite food. So, with the help of his parents (and more specifically his mom’s delicious pizza sauce recipe) he opened his first store in Hull, Iowa in 1981. One of their major selling points were their cowboy-themed pizza names, a cool idea he got from his parents. Staple pizzas included The Texan Taco, The Bronco (meat) and The Sweet Whine  (ham and pineapple). The company sure has done well for itself since then. They now have 207 locations across 14 states in the US. If you’re pizza obsessed like me, you can even grab yourself a slice of the pizza pie as they have a ton of franchise opportunities available in 13 of the states. They ditched their corporate 9-5 life (the dream) and now have one of the most successful and fun-loving stores in the whole country. They have an impressive games area, free event spaces and have even invested in some neat tracking technology for deliveries (ideal for folks like me who get incredibly impatient when awaiting pizza goodness :P). 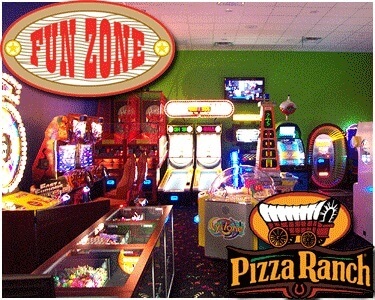 The Fun Zone Does Look Pretty Fun! Alongside pizza, the popular chain also serves up fried chicken, which is featured as part of their buffet, and a salad bar for those of us “trying” to watch the waistline. To be honest, I never touch the salad bar in a pizza joint, carb me up baby!! Fun fact about their buffet too, it’s a common misconception that their famous lunchtime buffets were always a staple, but they didn’t start them until the second store was built in 1983 over in Orange City. Before that, they only did buffets on a Tuesday night. Yes, you heard right! This chain has a lot of things that fascinate me, but their Presidential seal of approval is my favorite. Many future presidential candidates head on down to Pizza Ranch during the Iowa caucuses. Whether you love him or hate him, even president Trump couldn’t resist a slice, heading over to the Waukee store with owner Adrie during his 2016 campaign. So, what do they value most? Well, apart from pizza of course, I wanted to dig deeper into the company and found out what makes them tick, so I had a quick browse on their website. They’re not your typical corporate food chain AT ALL! And, TBH, any company that uses words like ‘legendary’ in their mission gets the nod from me. They’re very open about their Christian routes and values, and their staff will genuinely pray for you if you ask! They have a prayer request form in all their stores if you’re in desperate need of some divine intervention mid-slice. Now I’ve always found pizza heavenly, but never had the staff pray for me in a pizza joint, that’s next level if you ask me! If you ever head up past the border into Canada and are craving some pizza similar to Pizza Ranch, why not check out Pizza Pizza? 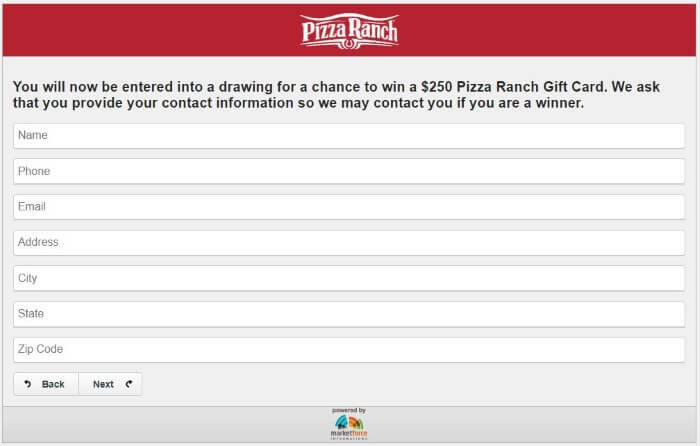 Just like Pizza Ranch, there’s an official Pizza Pizza survey where you can win some free food just for leaving your feedback! Otherwise, you’re more than welcome to give them a call on 866-835-5871. Or send them a message here.